This litter will be raised in Lake Villa, Illinois. There are puppy reservations available for performance, hunt test / field, possibly show and experienced pet hunting homes. For information on this litter contact Liza Simon Roper lsroper84@gmail.com . Clearances; Both Parker & Bree have OFA Hip certification (Parker Excellent & Bree Good), OFA Normal Elbows, Current Normal OFA Eye Exam (within 12 months), OFA Normal Heart clearance by a Board Certified Cardiologist, normal thyroid function, not on any medications, no skin allergies, seizures or other auto-immune disorders. Genetics Testing; ICT Clear, PRA-Prcd Clear, PRA-1 Clear, PRA-2 Clear, DM Clear. For more pictures, please browse through the slide show below. We are excited to announce this planned breeding between Parker & Bree. Our goal for this breeding is to produce athletic, biddable, intelligent companions and Performance/ Hunting Goldens that can be easily trained in any venue, and become a wonderful family member. Both Parker and Bree have fun loving personalities, exceptional Golden temperaments with all other dogs/ puppies, love to work, live to retrieve and also easily settle in the house. The puppy pedigree has a very low inbreeding coefficient and is a wonderful blend of field, performance and conformation Goldens. Parker has a zest for life and it shows. We routinely have comments from judges or spectators at a trial that he is so fun to watch as it is obvious that he is having a good time. He is a confident boy with lots of drive and lots of love for his family. He is good with strangers and especially small children, very gentle when they stop and ask to pet him. 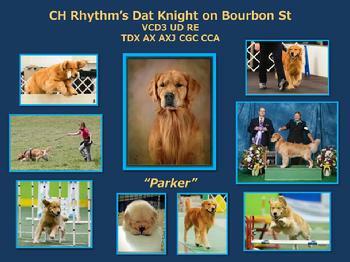 Parker started his showing career by earning his TD at the age of nine months. Before he was 2 we went to the Golden Retriever National show in Asheville, NC and entered agility, rally, obedience and conformation. The highlight of the trip was Beginner Novice. Parker took third out of 54 with a 199 (sadly I messed up the run-off). He took it all in stride and gave it his all in every trial. Since then we continue to work up the ladder of titles in all venues. His upbeat attitude and trainability have made this a fun journey. As Parker was a first litter for his breeder we promised we would try conformation. This was new to both of us but he quickly found success. The key for him was finding a handler that was willing to work with a boy with a lot of energy and who loved toys. He is not your standard conformation dog. He went best-of-breed once and won back to back majors at a Golden Specialty, and after that he quickly finished. We have also worked on field training (he showed great potential, loved the water and the retrieves). We hope to get back to this training but there are only so many hours in a day! Parker has a very solid pedigree, is a moderate boy with a strong headpiece, nice pigment and a clean mover. All of these attributes he has been passing along to his offspring as well as his outgoing personality. He is currently working on his MX/MXJ and UDX titles. Bree is a smart, energetic girl who loves to work in multiple venues. At 18 months she earned the Triatholon Award at the Golden Retriever Club of America in Witchita Falls Texas. She went on to easily earn her Started Hunting Retriever and Junior Hunter titles the following year demonstrating a love for the field that is unparalleled. Bree is happy to learn any game. Her happy, confident, problem solving attitude is an asset in any venue. While she has finished her Novice Obedience title, she has also finished her rally Advance title and is trained through Open in Obedience. She loves agility and will be working on her Novice title in that venue this summer. In all of the games, she is happiest in the field, earning her Seasoned Hunter title in 4 entries, and currently working towards her Senior Hunter. She is very fast, watery, and fearless, enjoying every moment! 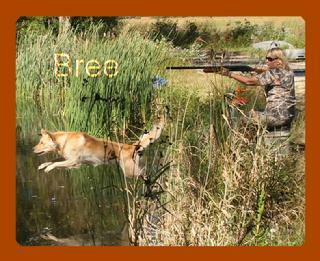 While focused, energetic in the field, Bree has an incredible “off switch”. She is a pleasure to live with and can run with other dogs without issue. She is friendly with people and is adaptable to any situation she has been placed in. We are having a blast training and it's an incredible journey with this smart, talented, fun loving girl! Contact: Liza Simon-Roper at lsroper84@gmail.com if you are interested in a puppy from this litter.